Need an alternative to Wax? Do you want your car to look shiny and new? And keep it that way for many years to come? Well, there are a lot of products you can use to protect your car and keep it looking good. Most of the car owners use a special car wax or paint sealant and both promise paint protection and shine, this can make it hard to decide which product you should use. But there are some fundamental differences between these two and they come with their own pros and cons. Car waxes are comprised of natural ingredients with some type of wax as a base. The most popular type of wax used for these products is carnauba wax, which is harvested from the Brazilian carnauba palm tree. The wax gets mixed with oils, other waxes, and some polymers to create a product that gives your car this beautiful finish. They usually come as a liquid or paste. How do car waxes work? Car wax melts on the surface of your car and blends into the surface. The main purpose of wax is to enhance the color of your paint and give it a depth and a glossy shine. It sits in the small crevices of the pain and makes your car look shiny and new. It also offers protection from water and dirt to some degree. What are the advantages of using wax? The biggest advantage of car waxes is that they will enhance any paint finish. It is a natural product that blends into the surface of your car and gives it more depth and dimension. The next advantage is that it will make the paint of your car look more vibrant, warmer and glossier. What are the disadvantages of using wax? Despite its advantages, it does have some disadvantages as well. The biggest one is its durability. Most car waxes have a melting point of 150°F to 180°F and below, this means that leaving your car in the direct sunlight during the summer could literally melt off the wax from your car. Car waxes are also not resistant to detergents so you usually have to reapply it after a few car washes. Most car waxes usually last no more than 8 to 12 weeks and require a constant reapplying to preserve the best result and look. Another disadvantage is the application itself. Car waxes are usually more complicated to use and require a perfect preparation in order to produce the best result. This takes a lot of effort and time, that not everyone can or wants to spend on his car. 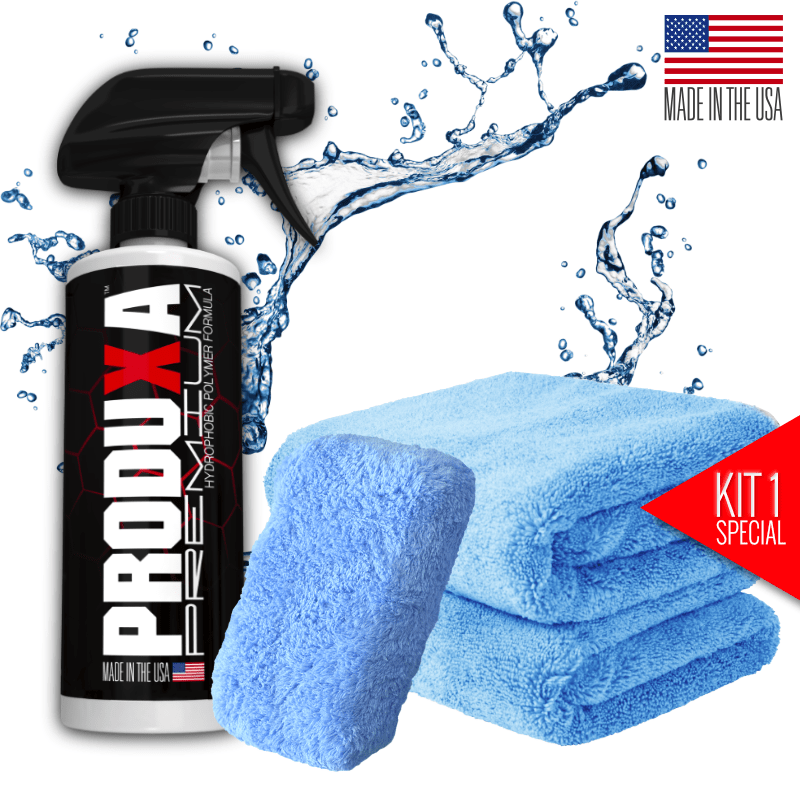 Produxa is a sealant that is specifically designed to protect the surface of your car. It is a liquid that contains a mix of polymers, and other synthetic ingredients. 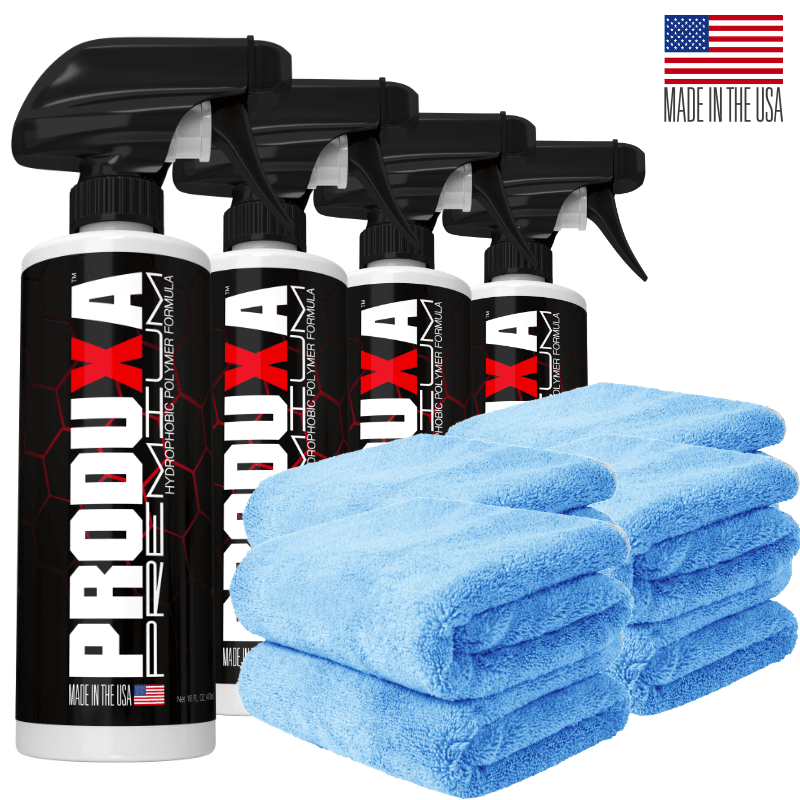 Produxa will form a protective layer on your car that protects it from UV rays, water, and dirt. Produxa lays on top of the surface of your car and builds a layer that protects your car from outside damage. The main purpose of sealants is to protect your car from UV rays, water, and dirt. It also makes your car look really shiny. What are the advantages of using PRODUXA™ Premium? The biggest advantage of a Produxa is its durability, it will last up to six months. Produxa forms a thicker and stronger layer than wax, which will protect your car from physical and environmental influences. It will give your car a glass or mirror-like finish with a strong light reflection, making it really shiny. Any dirt that collects on the surface can just be rinsed off. Another big advantage is the fact that Produxa can be used on other surfaces like glass, plastic, fiberglass, and stone as well. Applying Produxa is much easier compared to wax. We recommend that you wash your car and let it dry before applying, to make sure that there are no dirt particles on the surface. Always focus on a small section at a time and only apply a small amount. Keep in mind that a little goes a long way. Apply the product to the surface and immediately use a microfiber towel to buff it off and polish the surface. It is also a good idea to apply two coats when using Produxa for the first time, this will make sure that the base layer is even and covers the whole surface. Not sure which one you should use? Why not use both? 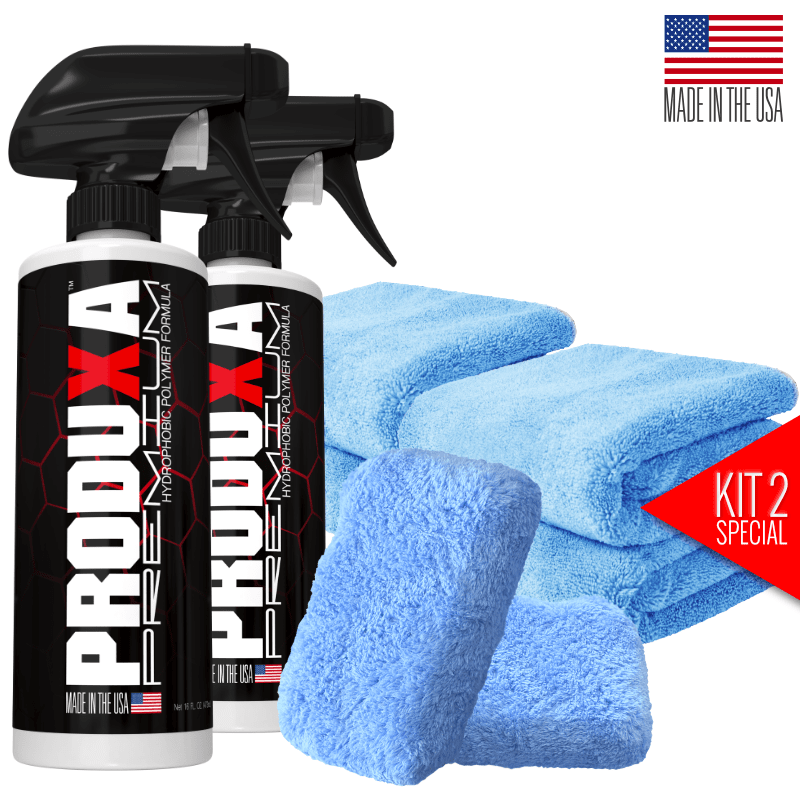 You can actually combine Produxa and a car wax and get the advantages of both. Start by cleaning your car thoroughly and strip off old wax. After that, you can apply Produxa which will protect the paint of your car. Finally, apply a car wax to get that deep and glossy shine. The Produxa layer under the wax will last for several months and you can simply reapply the wax when needed. Using both products will give you the perfect combination of beauty and longevity. In the end, everyone has to decide if they want a product that protects their car for a long time or if they want a product that will make their car look better than ever before. I hope that this post answered some of your questions, making the decision easier.